As Tamika Catchings shared defining moments from the journey of her life, she never mentioned the four Olympic gold medals she earned as a member of the U.S. women’s basketball team—or how she led the Indiana Fever to a championship in the Women’s National Basketball Association (WNBA). 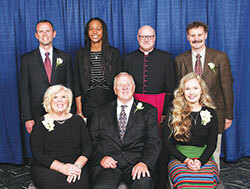 Instead, the keynote speaker at the archdiocese’s Spirit of Service Awards Dinner in Indianapolis on April 26 recalled a poignant moment from her childhood that propelled her to these accomplishments—and to her launching the Catch the Stars Foundation which helps disadvantaged youths achieve their dreams. The moment occurred shortly after her family moved to a new city when she was in the second grade, a moment that occurred a few years after she was diagnosed with a hearing disability when she was 3 years old. “In second grade, I realized I was different. Every single day, I went to school, I got made fun of—for the way that I talked, for the way that I looked, for the hearing aids I had to wear,” Catchings told the 460 people who had gathered at the Indiana Roof Ballroom for the fundraiser for Catholic Charities Indianapolis. That’s when Catchings, whose father played in the National Basketball Association for 11 years, saw sports as a way to fight against those taunts and to follow her mom’s advice. “I realized real fast that if I became really good at something, and you made fun of me, I’d say, ‘Let’s go play basketball,’ ” she said. “I might not beat you the first time or the second time or the third time, but I guarantee I would practice, and I’d come back and beat you, and that would be the last time we would play. Later in her talk that was marked by her stories, her charming personality and her touches of humor, Catchings shared another defining moment that happened when she was a sophomore at the University of Tennessee—a year after her college team finished with an undefeated season. Catchings and her three teammates rushed to the front of the church. She also shared the moment when she saw the impact she could have on other people. It came after her father retired, when he worked for an organization that helped people in need—a childhood moment when she helped to give food to people at Thanksgiving and toys to children at Christmas. “That’s when the seeds got planted,” she said. Those seeds have since led to the New Year’s resolution that Catchings made for 2017. “Every year, we make New Year’s resolutions. One thing I decided was to focus on one word. My one word, ‘Impact.’ Everywhere I go, everywhere we go, we have a choice. We can impact people positively or we can impact people negatively. You have the choice. It’s what Catchings did during her basketball career before retiring last year. It’s what she continues to do with her foundation. And it’s what she hopes to do in her new position as director of player programs and franchise development for Pacers Sports and Entertainment. “When I look around at all the people here—and all of us come from different walks of life—we’ve all gone through our own journey and we’re still going through our journey, and you think about all the people who have helped us get to where we are today. 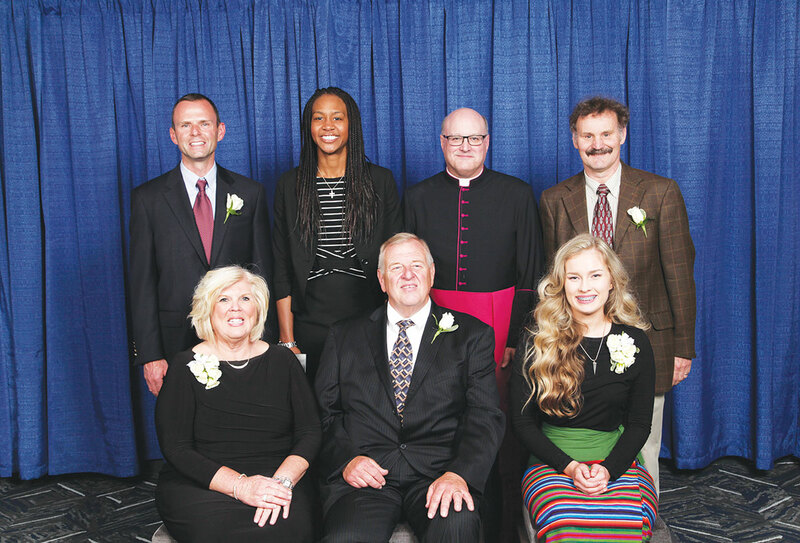 During the dinner, Catholic Charities executive director David Bethuram also focused on the journey that the agency has made in the archdiocese since its founding in 1919. “Throughout our history, Catholic Charities has worked to meet the needs of those most vulnerable among us,” Bethuram said. He noted that the majority of Catholic Charities’12 programs focus on three categories: caring for children, strengthening families and welcoming strangers and newcomers. A principal challenge today is trying to address the plight of poverty that affects so many people and families. “We will continue to provide ‘safety net’ services that help with food, utility and emergency housing,” Bethuram said. “But today, Catholic Charities is also committed to identifying and implementing strategies and opportunities which will eventually lead those currently living in poverty out of poverty. Bethuram also asked for help from the community in this effort. His closing message captured the difference that Catholic Charities wants to make for the families who seek the agency’s help. The efforts of Catholic Charities Indianapolis were also recognized by Nicole Finelli, the event chairperson for the Spirit of Service Awards Dinner. The celebration ended with Msgr. William F. Stumpf saluting Catholic Charities Indianapolis for serving 75,000 people in 2016. The archdiocesan administrator noted how that help matches the direction that Pope Francis has set for the Church. He then mentioned that Pope Francis recently made a surprise appearance, via a videotaped talk, during the recent TED (Technology, Entertainment, Design) conference in Vancouver, Canada.